Received $250,000 USD from the Annenberg Foundation / Explore of Los Angeles. This supports the creation of a remarkable new opera set at Fallujah and NYC in 2004. Music by Canadian Tobin Stokes, libretto by American Heather Raffo, based on a scenario by Christian Ellis, USMC (ret'd). It is the largest commissioning grant in Canadian history. There have been three workshops to date: 15 and 16 May, actors only, text only; 13 and 14 September, singers and piano, Act 1; 13 and 14 November, singers and piano, Act 1 (revised) and Act 2. Coming: April 2012, first rehearsal of 11-piece orchestra. May 2012, final workshop, with orchestra, at Frederic Wood Theatre. It was the subject of a half-page feature by Marsha Lederman in the Globe & Mail. Continued work on Margaret Atwood's first opera, Pauline, set at Vancouver in March 1913, and starring the great Judith Forst as Pauline Johnson. The text workshops have been concluded. Johnson was an important Canadian artist whose life ended in a rooming house at Bute x Alberni, where our opera is set. Pauline Johnson named Lost Lagoon, and is buried in Stanley Park. Saw the formal launch of Canadian Classics. It is a new series first proposed by City Opera and is now managed and distributed by Naxos, the world's largest classical recording company. The first recording, Jeff Ryan's Fugitive Colours, was released with Bramwell Tovey and the Vancouver Symphony Orchestra in September. 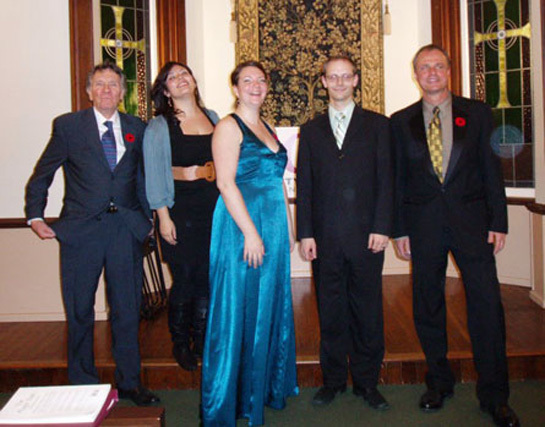 Gave concerts and recitals at Minoru Chapel in Richmond (twice; November 2 concert pictured above), Roedde House, the DTES, Carnegie Centre, Italian Days on Commercial Drive, MacMillan Planetarium, Granville Island (three times), and more. These many concerts and recitals derive from our mission statement: "Our goal is to bring chamber opera to a wide audience." Launched a project to expand -- carefully and meticulously -- our extraordinary Board of Directors. Building from strength, and taking the long view. Gifts to City Opera are tax-deductible in Canada, and in the United States. We are now able to receive tax-deductible gifts of bonds and securities in Canada. If you like what we do, we ask your help. To produce the operas we create, and re-create, and to continue to bring opera in concert across Metro, we ask your help. We have also created a Commissioning Fund, and a Production Fund, to allow supporters to nominate gifts for work that you may feel particularly important. Anything you might contribute would be incredibly helpful. Donate any time via the City Opera page at CanadaHelps.org. We are now able to issue valid tax receipts for gifts originating in the United States. How? Please contact City Opera Treasurer Hazel Currie: info@cityoperavancouver.com. 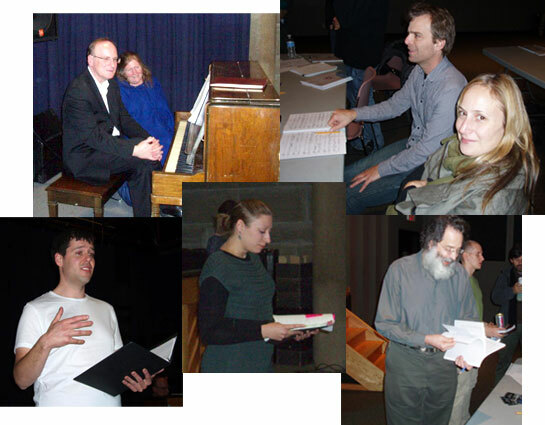 2012 will be an exciting year for chamber opera in Metro Vancouver. Your help makes it possible. Thanks for considering us. We believe in mutual aid. City Opera was delighted this year to be asked to serve as outside advisor in the creation of an important new opera, KHAOS, being produced by our colleagues at Nelson Community Opera and the Amy Ferguson Institute. The Nelson premiere will be given at the Capitol Theatre on 8, 9 and 10 March 2012, with a possible held-over performance on March 13. KHAOS will tour thereafter. Music by Don Macdonald, and libretto by Nicola Harwood. www.khaosopera.com Contact: mar-lena@shaw.ca. Our artistic director knew and studied with the legendary conductor Carlos Kleiber for 15 years. He has written a book about him. Corresponding With Carlos: A Biography of Carlos Kleiber, was released in NYC on 25 November. Here, a small exemplar of unsurpassed elegance and phrase: Carlos Kleiber leading the Vienna Philharmonic in 1989.
to our wonderful Board, advisors, staff, stage and creative artists, our production partners, our business and community partners, our coaches and singers - and above all to you, whose generosity is helping build Canada's leading chamber opera company. Happy Holidays to all, and thanks for all. A great year lies ahead.